This naturally gluten, grain and dairy free soup is a creamy luxurious hug in a bowl. A hug that will boost your health though its inflammation busting ingredients of turmeric, ginger, coconut milk and bone broth, aka chicken stock. Helping you manage pain, combat and ward of bugs and viruses , auto immune diseases and generally look after your body inside and out. Coconut milk has had ill informed bad press in the past due to its high fat content, but it can actually help you lose weight. The healthy fatty acids in coconut milk are understood to actually boost your metabolism and immune system, WOW! It’s also one of natures strongest medicines full of vitamins, anti oxidants and lauric acid, that help fight and prevent viruses, infections and disease. I love the creaminess coconut milk adds without the lactose of regular cream. It’s a great handy addition to many dishes when you want a creamy taste without the widening waist band or dairy. As well as reducing inflammation making your own Chicken stock (see here for how) is also great for healing the gut, fighting the flu or cold viruses, reducing joint pain and healthy bones. 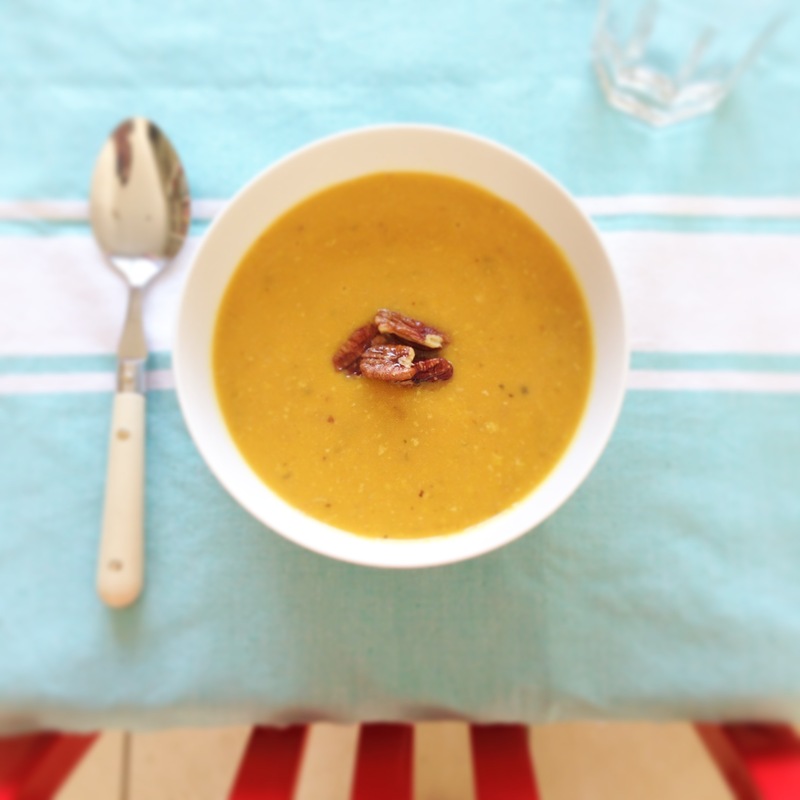 At this time of year I love to swap salad lunches for some warm nourishing soup. Easy to make, store and take with you soup is a no brainer meal. This soup is particularly easy, you don’t even have to peel the butternut squash, giving it an extra dimension of texture and flavour. The honey roasted pecan nuts finish the soup off with a little bit of sweet sophisticated nuttiness. Swoon. A warming anti inflammatory, creamy luxurious hug in a bowl. Let the squash and onion cool down and then blend with the bone broth, ginger, turmeric, garlic and soy sauce. Put some baking paper in a roasting tray and lay your pecan nuts on top. Cover with honey and then roast in the warmed oven for ten minutes. Sprinkle on the top of your soup and enjoy! Yes should be great. Let me know how it goes? This sounds lovely but have you tried it with veggie broth instead for us non-poultry eaters by chance? I just bought my first butternut squash at the farmers market yesterday and looking for a recipe! Thanks Tabitha! Hi Lisa, I haven’t tried it but I’m sure it would work as most of the flavour is from the squash, ginger, and soy. Let me know how it is? Thank you Tanya. It is a beautiful soup just right to ease in Autumn and winter. Thank you Lori, it’s hopefully going to be a great winter bug buster! Add this to your repertoire of GF foods! I like Butternut Squash in the Fall–very comfy food-ish. Yummmm. Reblogging your Butternut Squash Soup on my page. Looks yummy. Comfort food for Fall. Thank you great autumnal colours of squash are lovely. Thank you it’s one of my favourites too. I don’t have a sub for coconut milk I’m afraid. It’s such a unique ingredient and so central to this recipe I’m unsure it’s possible. Sorry. Hi there Tabitha, if we can’t use soy do you have an alternative please?